In celebration of "Dracula: the Series" being shown on the Sci-Fi channel after being unavailable for years and years, Lucard's Home Page held a Lucard Trivia contest. Two new questions were posted each Saturday when a new episode aired--one directly related to the new episode and one more obscure question. Now that the Sci-Fi channel has completed its premier airing of the Lucard show, the contest is over and the answers are available! K'lin kaShante won the contest with 34 correct answers, and she did it all from memory! Try the questions yourself for fun (but no profit, since the contest's over), then link to the answers and see how well you did. Question #1: What food does Lucard find irresistible? Question #2: In what Canadian province did Geordie Johnson grow up? Question #1: Who crafted the Cross of the Magyars? Question #2: What make car is Lucard's limosine? Question #1: What is the key ingredient of the quinidrine solution? Question #2: What chess piece does Lucard use as a decorative motif? Question #1: How does Lucard destroy St. John-Smythe's vampire gun? Question #2: On which hand and finger does Lucard wear a ring? Question #1: Name all the different forms in which Nosferatu appears. Question #2: What color is Gustav's car? Question #3: For how long has Klaus been a vampire? Question #4: What piece of exercise equipment does Lucard have in his office? 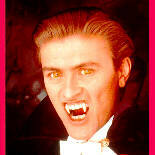 Question #1: What fact about vampires did Jonas Carey not know before he became a vampire? Question #2: What city are Max and Chris from? Question #3: What prized possession of Lucard's does Gustav destroy in "Damsel in Distress"? Question #4: Name two episodes in which black and white scenes appear. Question #1: What does Lucard eat while watching Gustav on TV in "Mind Over Matter"? Question #2: To whom is Gustav writing when he receives Lana Zorro's automatic handwriting call for help? Question #1: Multiple choice: In "A Little Nightmare Music," Chris sings that "Love is like ..." a) a nightmare, b) a dream, c) a factory, or, d) a bad haircut. Question #2: Name the two different last names that Geordie Johnson's very Lucard-ish character George used when he appeared in "Kung Fu: the Legend Continues." One point for one correct answer; two points for both names. Question #1: What is the name of the Tomassi painting that Julia Heisenberg tries to sell Lucard in "Get a Job"? Question #2: Gustav is often troubled by a bad (fill in the blank with correct body part). Question #1: What was it that Lucard saw in an old movie and just had to have? Question #2: How old is Chris? Question #1: What kindness does Max do for Lucard as he lays dying in "Bad Blood"? Question #2: Name three things that Dr. Varney carries. Question #1: How does Lucard reward Peter, the zombie who helps him escape Mrs. Pfenning's first assassination attempt in "Sophie, Queen of the Night"? Question #2: What is pictured on the postcard that Sophie sends to Gustav and the boys after she has become a vampire? Question #1: What does Ted Singleton call Lucard? Question #2: In the teaser of "My Girlfriend's Back..." Lucard is staring longingly at a sign. What does it say? Question #1: Name three things that Amber Santana does to try Lucard's patience in "My Fair Vampire." Question #2: Name three episodes in which Lucard throws or drops dishes (i.e., plates, glasses, etc. of any type). Question #1: What form is Klaus in when Max first finds him in "Decline of the Romanian Vampire"? Question #2: What was Gustav's profession (other than vampire hunter)? Question #1: In "I Love Lucard," we actually see Lucard wearing a casual outfit... of what does it consist? Question #2: What error is found in the last scene of "I Love Lucard"? Question #1: Why didn't the Cross of the Magyars work on Lawrence Lei? Question #2: What special tools does Lucard use at the end of "Bats in the Attic"? Question #1: What caused Gustav to have the nightmare in "My Dinner with Lucard"? Question #2: What shape is Lucard's dining room table? Question #1: Where is the entrance to Lucard's refuge located? Question #2: How does Gustav communicate with the others at the end of "Klaus Encounters..." and what message does he leave?